California sea lion Hoppie found himself up a river with no way home—until The Marine Mammal Center came to the rescue. Hoppie the wayward sea lion was released today at Chimney Rock in the Point Reyes National Seashore. He completed his long journey, which began with a 100-mile swim up the San Joaquin River, by returning to his natural habitat in the ocean. During the month he spent rehabilitating at The Marine Mammal Center, Hoppie became a media superstar and touched the hearts of people all over the world. His release back to the wild, along with two other sea lion pups Eugene and Fenimore, was well attended by the public and the media, including the San Francisco Chronicle, KTVU, and KCBS. Also in attendance was Hoppie's namesake Eric Hopson, from the U.S. Fish and Wildlife Service, who first reported to the Center that a wayward sea lion was found in an orchard near Modesto. Hoppie continues to eat well during his recovery at the Center and has gained almost nine pounds! This is a great sign for a sea lion pup who arrived malnourished. Once Hoppie gains a bit more weight and our veterinary staff confirm he is strong and healthy, he’ll be able to return to his ocean home. During his stay here, Hoppie has been quite the media darling, catching the attention of local, national and even international reporters! It seems the story of this wayward little sea lion had an impact on many people. Check out some of Hoppie’s media coverage. You can help wish him well with a life-saving gift of fish! Hoppie is doing well at the Center. He is eating lots of fish and will soon be able to return to his ocean home, completing his odyssey through the waterways of Central California. Watch a video of Hoppie as he rehabilitates at the Center and plays with one of his penmates. Hoppie is a sea lion pup who swam up the San Joaquin River and found his way 100 miles inland. California sea lions are found all along the coast from Vancouver Island, British Columbia to the southern tip of Baja California in Mexico. They spend time swimming, feeding and playing out in the ocean as well as hauling out on shore to rest. But one place you are unlikely to see a California sea lion is in an inland area, miles from the beach. That is, unless you’re in the area around Modesto, California, which, surprisingly, has been the site of more than one rescue by The Marine Mammal Center. Recently, a small California sea lion was spotted in San Joaquin River National Wildlife Refuge, more than a 100-mile drive inland. Named by the person who found him, “Hoppie” had swum up the San Joaquin River. The Marine Mammal Center dispatched a team to rescue the lost sea lion, and he arrived at our hospital on March 31. 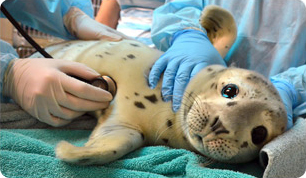 The Center’s veterinary staff examined Hoppie and determined that he was underweight and malnourished – not surprising since he was so far from his ocean food source. Another animal rescued far from home was Chippy, one of our most well-known patients. In 2004, he was found by police officers near Los Baños, California, just a short distance south of where Hoppie was rescued. Chippy rests on a Highway Patrol car. Chippy, a 315-pound adult California sea lion, had also traveled up the San Joaquin River channel – but his journey ended atop a police cruiser! Veterinarians at the Center discovered that Chippy had been shot and a bullet was lodged in the soft tissue behind his skull. We hope Hoppie will one day return to the ocean like Chippy did. But before he can be released, Hoppie must gain a healthy amount of weight. Our animal care experts have been feeding him plenty of fish and report that he is eating well. Hoppie (center) is one of dozens of malnourished sea lion pups currently in the care of The Marine Mammal Center. Hoppie is just one of many young sea lions we have on-site at The Marine Mammal Center right now. Many of these animals are underweight and starving, which means we have many hungry mouths to feed. You can help ensure that patients like Hoppie get all the food and nutrition they need to regain their strength and return to the wild.